Lately, I've made quite a few thrifting scores. I really love showing off what I've discovered, not so much to brag, but because y'all understand just how cool these finds are and I have to tell someone. Most of these were discovered two weeks ago while we were on vacation. 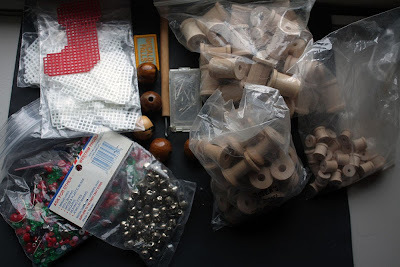 First up is this bag of miscellaneous craft supplies. One of the local thrift stores just bags up a bunch of the miscellanea they receive and sells it cheap. I kinda imagine a box in the back labeled "Arts & Crafts" that they toss the bits into and wait until it's full to send it out on the floor. Anyway. . .this big-ol-bag was only THREE BUCKS. This is what I picked out of that bag. 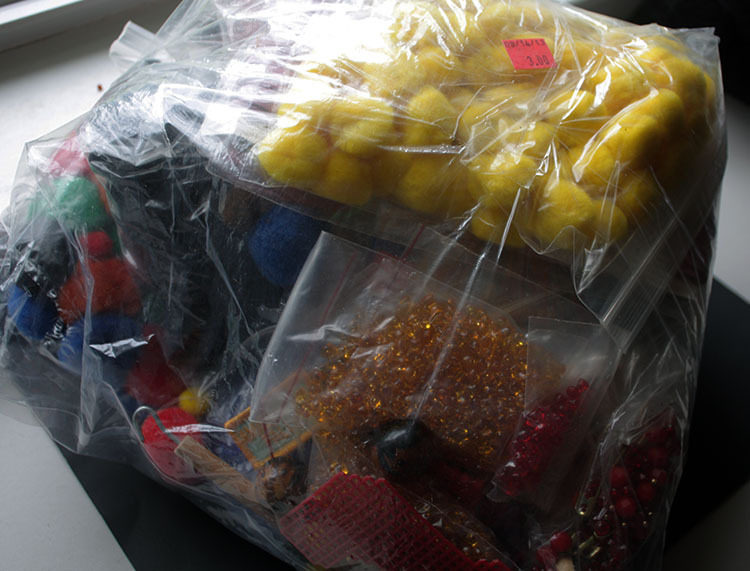 The rest of the stuff (the plastic beads and fluffy pom-poms will be re-donated). I've got an idea for those spools. 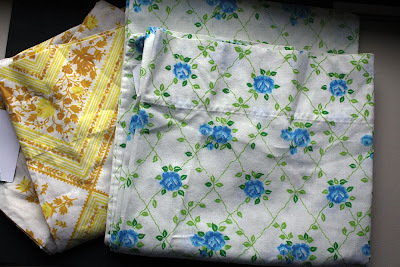 . .
Next up, at the same thrift store I snagged a few vintage pillow cases. One day, when I learn to sew, I plan on making a cozy quilt out of all the vintage sheets and pillow cases I've collected. Pat and I also walked through my favorite local antique mall and he lost me for a bit in there. When he found me, I was in the floor pawing though a basket full of metal stamps. Most of them were not my taste so I left them for the next lucky crafter, but I did take these home for a steal. If you can't see them; that's a small flower, a peace sign, an asterisk, a larger flower, and my name (Hope)! At the bottom of a bin of odds and ends in the same antique mall, I uncovered this treasure. It's a length of bone and mother of pearl buttons!! I wasn't leaving without this. 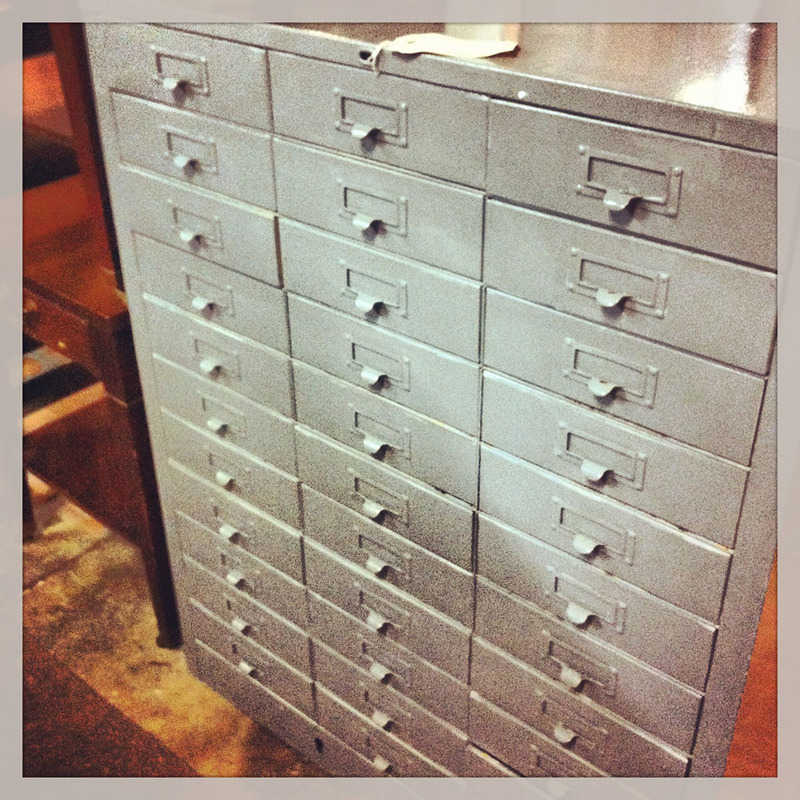 The major find at that particular antique mall, and possibly my find of the century (though in fact, Pat spotted it) was this amazing cabinet of drawers. That was the actual picture I took of it in the antique mall because I wasn't sure that it would be mine. I wanted to capture its awesomeness before I had to leave it forever. It took a day of convincing, but now that baby's nestled in all cozy-like in my craft room. I'll share more of it at another time. Lastly, I was able to browse another antique store this week and walked out of there with this loot. That's a big jar of more vintage buttons and some very cool hardware. I hardly ever find super cool, old hardware and was STOKED about these hinges, keyhole, lock part, and aluminum numbers. Now I just need to eke out some time to play with all these goodies. I'd love to see/hear about what you've found while thrifting too. What do you keep your eyes out for while at flea markets, thrift stores, and antique malls? Do you have other places you frequent for the best scores? What great finds! Love, love thrift stores. You never know what you will find. TOUCH DOWN! Woooo, love what you found & that big cabinet is awesome~ Must be something in the air with vintage buttons this past week. I did a post on this Thursday. Tammie - Oh. ..we'll see some touchdowns tomorrow! ;) I'm always on the lookout for buttons. I really need to start making more with them, but even in my jars they just look awesome. I do love your Thursday thrifting posts. I'm trying to catch up on my blog reading so I'll see your post later today I'm sure! Thanks for swinging by! Nice score on the file cabinet! Love the spools and the cabinet-great finds! Metal stamps too-wow! I live in northern Virginia (cost of living is sky high), so coming across thrifty finds is rare as the antique shops/flea markets have picket up on the fact that people in the area have money (not all of us are rolling in money though ;) )! There is a very large flea market in western New York named Antique World Market that I have been too and found a few wooden trays/boxes for my studio. http://www.antiqueworldmarket.com/ I grew up in that area and like to go there if time permits during a visit to my parents. Have fun with your new to you treasures! Great things you got!! Love that cabinet! I look for all the same things as you, in all the same spots. I have a couple thrift stores that always have a nice selection of cheap (but nice) buttons. And I love rooting around in a bin of "little things" looking for something that can be made into jewelry. Now that's fun! LOVE the cabinet!! I scored one couple of years ago - an old army cabinet with 2 columns of drawers. The man added wood sides, top and bottom baseboard, all painted black. You'll be amazed at the amount of stash you'll be able to store. Flea markets are so much fun. Ooooo! Those drawers are awesome! You know in the south - these are almost like "chester drawers!" 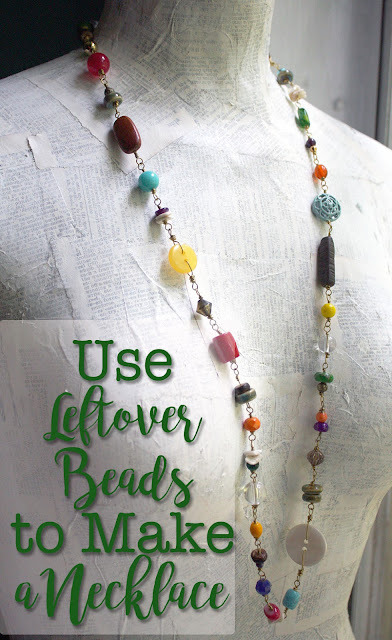 I can't wait to see what you do with those spools! Oh, those drawers are fabulous. I could store tons of treasures in there.